"This group of houses has no history that can be, or at least has been, traced. The houses are interesting specimens of street architecture of the beginning of the seventeenth century. They are now about to be demolished." 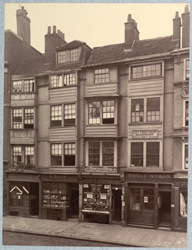 The Society for Photographing Relics of Old London was created to record London's threatened historic buildings, many of which were demolished in the Victorian period.